People who are unfamiliar with yarn crafting often confuse knitting and crochet. It's totally understandable that this happens; these crafts share many similarities and common elements. But they also have significant differences. Both crafts utilize yarn or fiber, and you can make the same sorts of projects such as sweaters, shawls, wraps, blankets, afghans, scarves, hats, mittens, socks, etc. with either technique. Both knitters and crocheters work from patterns and use abbreviations. Some of the abbreviations are even the same. Knitting and crocheting both require similar skill sets: hand-eye coordination, an eye for color and design, an affinity for fiber, the ability to plan a project from start to finish and see it through. Mathematical ability is helpful, although not strictly necessary, for either craft technique. Both knitting and crochet offer a number of amazing health benefits. Above all, both knitters and crocheters need to have the patience necessary to keep working, stitch after stitch after stitch, until a project is completed. 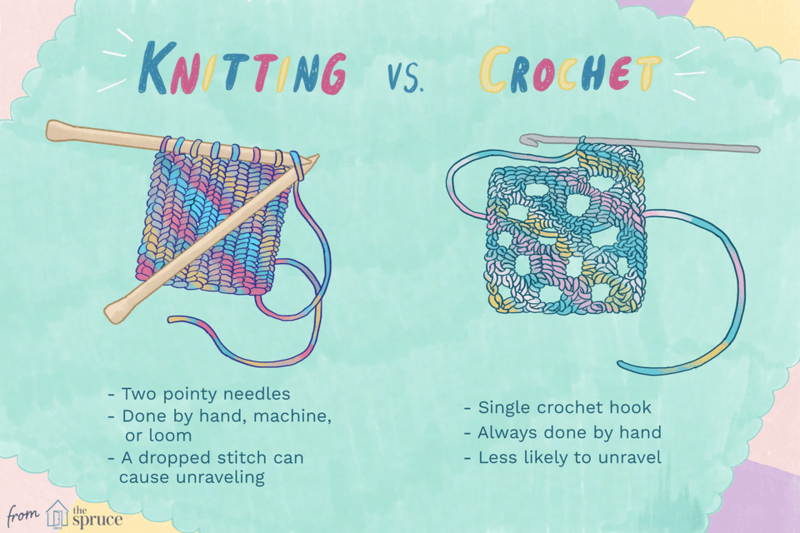 Watch Now: What’s the Difference Between Knitting and Crochet? When it comes to supplies, knitters and crocheters end up with similar yet different stashes; you'll find most of the differences in the tools department. Some knitters—hand knitters, that is—use pointy knitting needles. The pointy needles can appear in several different types of configurations; they often exist in sets of two, although this is not always the case. Sometimes the two needles are connected by a cord, as in the case of a circular knitting needle. Sometimes they come in sets of more than two. For example, double-pointed sock knitting needles often come in sets of four or five. If pointy needles are part of the process, then the crafter in question is knitting by hand. Hand knitters are only a subset of the total number of knitters. In addition to hand knitters, there are also loom knitters and machine knitters. There are many different types of looms and machines that can be used for knitting; they range from the simple to the complex, from the small to the large. Some small machines can be used to knit i-cord socks or various other small projects. There are larger machines that can be used to knit sweaters, garments or other similar projects. Then there are huge circular machines, some of which wouldn't even fit in the living room of an average home, that mass-produce knitted fabrics for the garment industry. So, to recap, knitting is performed using either pointed knitting needles, knitting looms, or knitting machines. Crocheters don't use pointy needles or machines to make their projects; they use a single crochet hook. The hook can be small or large, or any size in between. It might typically be made of steel, aluminum, bamboo, plastic, wood or bone, but it's definitely a hook. Although you will occasionally hear people reference "crochet needles", there is no such thing. There are only hooks in crochet. Crochet is always done by hand, never by machine. A crocheter's movements are so intricate that, thus far, nobody has been able to create a machine that can duplicate them. There is something in the fashion industry that is called a crochet machine, but it does not actually make the same stitches as those made in crochet. They create blanket stitches that mimic crochet but, upon closer examination, it is easy to see that it isn't really crochet. So, to recap, crochet is performed using a single crochet hook and is always done by hand rather than with a machine. This, the use of a crochet hook rather than needles or a machine is what makes the significant difference between the two crafts. But the difference in tools results in other differences as well. There are many different types of yarn and they can all be used equally in knitting as in crochet, although some fidgety yarns lend themselves better to one craft or the other. Thread is typically reserved for tiny crochet needles; it's not something mentioned much in knitting. There is a long-standing rumor that crochet uses up significantly more yarn than knitting but many people have tested this and it remains controversial as to whether or not it is true. As a general rule, knitting and crochet use the same type and same basic amount of yarn. Both crochet and knitting involve manipulating loops of yarn. With (weft) knitting (the kind of knitting closest to crochet if there can be said to be such a thing), the loops build on each other in a way that requires multiple active loops to be held on the needles. Each stitch depends on the support of the stitch below it; if a knitter drops a stitch, the whole column of stitches below it might unravel. With traditional crochet, there usually aren't many active loops at one time—usually only one loop, or possibly a few loops. (There are exceptions to this in some advanced stitches and niches of crochet such as broomstick lace). The stitches build on top of each other, but the active loop is the only spot from which the fabric is susceptible to unraveling. So, knitting tends to unravel more than crochet; frogging is simpler in crochet than in knitting. It is impossible to objectively discuss which technique is "better" for any given type of project. People often want to know things like, "Which is better for making afghans, knitting or crochet?" or "Is it better to knit a hat, or crochet it?" To the novice, these seem like perfectly reasonable questions. The truth is, the "best" technique for any given project comes down to personal preference. Both of these needlework techniques are worth learning, knowing and using. One reason that this question is so common is that the differences in techniques were a lot more pronounced back when yarns were so different and limited. The technique of knitting with needles allowed for more drape and better fit, so people typically used knitting for garments and crochet for things like blankets or table runners. That's not the case, today, though, because the range of both materials and advanced crochet techniques makes it possible to create all of the same items that can be made with knitting. A great example is with socks. Socks used to be something only knitters made but now there are plenty of crochet sock patterns. Ask this question of ten different yarn crafters and get ten different responses. Many people believe that crochet is an easier craft to learn because it requires only the use of the dominant hand. However, since the second hand is used to help feed the yarn in crochet, it's not this simple. Many people do indeed find that crochet is easier to pick up. But just as many people who have tried both crafts find that it's easier to knit. People tend to prefer one over the other after practicing each, but there are also people who enjoy both equally. People who try one and find it difficult may want to try the other to see if it suits them better. People who aren't familiar with knitting or crochet generally can't tell the difference between the two at a glance. Those who craft in one or both of these forms easily come to recognize the stitches that are from knitting and those that can only be done in crochet. However, the differences between the two are more and more difficult to identify thanks to a number of techniques that allow crocheters to create knit-like fabrics. Tunisian crochet is the most popular of these. It is a form of crochet that uses multiple hooks held on longer hooks (and sometimes even circular double-ended hooks!) to create knit-like fabric. Other ways to create knit-like fabrics with crochet are through knooking or through working in the third loop in half double crochet. And then there are some crafters who combine knitting and crochet in one item; such as crocheting an edging on a knit garment. The possibilities are endless whether you want to embrace crochet or knitting or both!